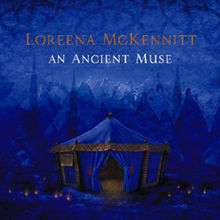 An Ancient Muse is the seventh full-length studio album of the Canadian singer, songwriter, accordionist, harpist, and pianist, Loreena McKennitt. It was released on November 20, 2006 internationally, and November 21, 2006 in the United States and Canada. It was her first studio album after a 9-year gap. It has now sold more than one million copies worldwide. Work on An Ancient Muse started in 2005. According to reports on McKennitt's Quinlan Road website, most of the inspiration for the tracks of the album came from the music of Greece, Turkey, the Middle East and the Far East. Most of the tracks, with the exception of three revealed at the mid-September concerts in the Alhambra of Granada in Spain, were completely unknown until the release. An Ancient Muse debuted on the U.S. Billboard 200 at number 83, with about 19,000 copies sold in its first week. This was also its peak position on the chart. All music and lyrics written by Loreena McKennitt except as noted. ↑ Katie Hasty, "Jay-Z Reclaims His 'Kingdom' With No. 1 Debut", Billboard.com, November 29, 2006. ↑ Artist chart history for Loreena McKennitt (albums), Billboard.com. ↑ κεχαριτωμένη, Gabriel's greeting to Mary in Luke 1:28, translated gratia plena "full of grace"
↑ "Musicline.de - Chartverfolgung - McKennitt,Loreena - An ancient muse". www.musicline.de. Retrieved 2010-05-15. ↑ "spanishcharts.com - Loreena McKennitt - An Ancient Muse". spanishcharts.com. Retrieved 2010-05-15. ↑ "ultratop.be - Loreena McKennitt - An Ancient Muse". www.ultratop.be. Retrieved 2010-05-15. ↑ "lescharts.com - Loreena McKennitt - An Ancient Muse". lescharts.com. Retrieved 2010-05-15. ↑ "Loreena McKennitt - An Ancient Muse - hitparade.ch". hitparade.ch. Retrieved 2010-05-15. ↑ "Loreena McKennitt - An Ancient Muse - austriancharts.at". austriancharts.at. Retrieved 2010-05-15. ↑ "dutchcharts.nl - Loreena McKennitt - An Ancient Muse". dutchcharts.nl. Retrieved 2010-05-15. ↑ "danishcharts.com - Loreena McKennitt - An Ancient Muse". danishcharts.com. Retrieved 2010-05-15. 1 2 "An Ancient Muse - Loreena McKennitt". www.billboard.com. Archived from the original on 14 May 2010. Retrieved 2010-05-15. "The Seven Rejoices of Mary"